Bishop Thomas Shaw retired earlier this year. Soft-spoken and clad in a subdued black robe of his monastic order, the Right Rev. M. Thomas Shaw seemed an unlikely choice in 1994 to lead one of the largest Episcopal dioceses in the nation. Yet his unswerving devotion to spirituality and his unwillingness to avoid political controversy turned him into one of the most visible and vocal religious leaders of his time. “Ever since I was a little boy I wanted to do the will of God,” Bishop Shaw told the Globe two years into his 20-year tenure as head of the Episcopal Diocese of Massachusetts. Diagnosed with brain cancer nearly a year and a half ago, Bishop Shaw died Friday in West Newbury in Emery House, part of the monastic community of his order, the Society of St. John the Evangelist. He was 69. At the same time, Bishop Shaw remained sensitive to conservative opponents of gay marriage at home and abroad. Even while advocating forcefully for gay rights within his denomination and beyond, he waited more than five years after Massachusetts legalized gay marriage in 2004 before giving priests permission to officiate at same-gender weddings. 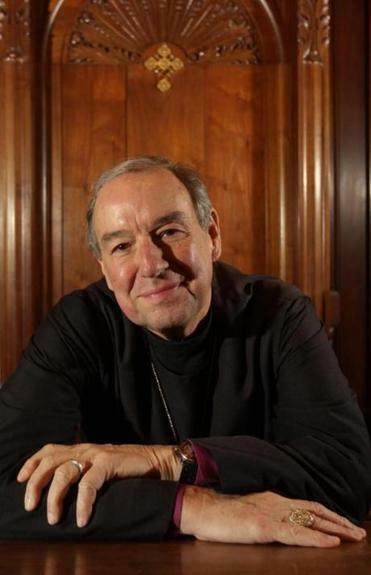 He was a leading supporter of elevating an openly gay priest, V. Gene Robinson, to become bishop of New Hampshire. Nonetheless, to better grasp the deeply held opposition some cultures have to homosexuality, Bishop Shaw went to Africa in the late 1990s and immersed himself in the Episcopal Church’s health and education projects in Uganda and Tanzania. A decade later, he traveled to Zimbabwe on a secret mission to express support for Anglican worshippers who were subjected to human rights abuses and to bear witness to their suffering through letters to US officials back home. “I don’t think I’ve ever been any place where the oppression has been that overt,” Bishop Shaw told the Globe upon his return. To see close up how public policy is forged, he moved to Washington, D.C., in early 2000 and spent a month as a congressional intern working for Amory Houghton Jr., an Episcopalian and a Republican who was then a US representative from New York and now lives in Cohasset. The following year, Bishop Shaw incurred the ire of Jewish leaders when he joined others outside the Israeli consulate in Boston to protest that country’s treatment of Palestinians. Uncharacteristically, he traded his monk’s garb for a purple cassock that announced the gravitas of a bishop. His participation surprised many Jews, and he subsequently spent years mending the rift through discussions with leaders in the Jewish community. “It takes a lot to admit, ‘I may have hurt you, and I want to understand why what I did or said hurt you,’” Rabbi Eric Gurvis of Temple Shalom in West Newton, a past president of the Massachusetts Board of Rabbis, told the Globe in 2013. Not all Jewish leaders were soothed by his entreaties, though, and Bishop Shaw continued to speak out for Palestinian rights. Born in Battle Creek, Mich., on Aug. 28, 1945, Marvil Thomas Shaw III grew up in a devout family and believed early on that he would give his life over to God. “The church was always at the center of my life,” he told the Globe in 1997. He graduated from Alma College in Alma, Mich., and received master’s degrees from the General Theological Seminary in New York City and Catholic University of America in Washington, D.C.
After being ordained to the priesthood in 1971, he was a curate at the Church of St. Mary the Virgin in Higham Ferrers, Northamptonshire, England, and then assistant rector of St. James Church in Milwaukee. When he was elected bishop in 1994, he was 48 and was the first monk in the church’s history to serve in that position. Then and until not long before his death, he lived in the order’s monastery on Memorial Drive, a short walk from Harvard Square in Cambridge. His home was a small cell in the monastery, and he managed to pray 90 minutes a day, even after taking on greater responsibilities as head of the diocese. “I wouldn’t have the perspective I have on my struggles if I didn’t pray,” he told the Globe in 1996. During Bishop Shaw’s tenure, among his proudest accomplishments were programs he created to serve youth and to help reduce urban violence. A diocesan camp and retreat center opened in Greenfield, N.H., in 2003, while in the South End, St. Stephen’s Episcopal Church initiated the Bishop’s Summer Academic and Fun Enrichment program, or B-SAFE, for hundreds of inner city youth. A graduate of the program, Jorge Fuentes, became a respected counselor and mentor, and his death by a stray bullet, across the street from his Dorchester home in 2012 was devastating for the diocese and Bishop Shaw, who presided over the 19-year-old’s funeral. Bishop Shaw’s final blog post included a video of him speaking at the Mother’s Day Walk for Peace in 2013, when he was part of a contingent of more than 600 Episcopalians who walked in memory of Fuentes. When Bishop Shaw thought the time had arrived to address his sexuality publicly, he took an understated approach, doing so in an interview while being filmed for “Love Free or Die,” a 2012 documentary about Robinson, who became the first openly gay bishop in the Episcopal Church when he led the New Hampshire diocese. Bishop Shaw told the Globe he didn’t want his choice to be a celibate monk to be held up as an example that lesbians and gays in the clergy should also choose celibacy. “My hope has always been … that we can move along this discussion about human sexuality in the best possible way, and I thought for myself the best possible way I could move it along as a celibate bishop was not by hiding it, but by not making myself the center of the discussion,” he said then. Funeral arrangements are pending for Bishop Shaw, who leaves a sister, Penny, of Louisville, Ky., and two brothers, Sam of Boulder, Colo., and Stephen of Sherwood, Ore. In January 2013, he announced he would retire by year’s end. A few months later, he said that he had brain cancer, and he began radiation and chemotherapy soon after.